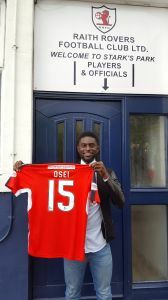 We are pleased to confirm the signing this evening of 18 year old forward, Yaw Osei on a one year deal. Yaw has featured in our last two friendly matches and has done enough in these games to convince manager Gary Locke and assistant Darren Jackson that he has a promising future in the game. FIFA international clearance is being sought for the former English Southern League player, who was registered with Chalfont St Peter until recently, and if received in time he may feature in our Betfred Cup Round 1 match away to Cove Rangers tomorrow evening. The Swaziland-born striker, who also holds a Ghanaian passport, already has a UK Residence and Work permit having lived down south for the last 6 years. A further signing tomorrow is expected, but is unlikely to be completed in time for the Cove Rangers match. 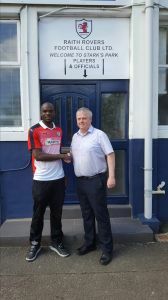 Meanwhile, in other news, we are pleased to confirm that international clearance has been obtained for giant defender Jean-Yves M’Voto who signed last Friday.